XENIA — This newspaper received a letter looking for a 1970’s Beavercreek physical education teacher, Judy Peele. Rita Clemmer’s letter described the impact Peele had made on her life. “I am a grateful, successful, happy person who really wants to find my middle school physical education teacher named Judy Peele. I am asked “who made a difference in your life” and the answer is always Ms. Peele,” said Clemmer. Spending time smoking cigarettes with the wrong friends, Clemmer was headed down the wrong path at Ankeney Junior High School. She saw information for the Chargers class and wanted to join because the previous classes looked like they had fun. Clemmer remembers approaching Peele and being told she would be placed on a waiting list for the Chargers class. Shortly after, Peele told Clemmer she could join the class. Peele does not remember how she admitted Clemmer into the class. Chargers was an intense 60-minute physical education class with a cap of 34-36 girls. When Peele introduced her idea of the class to the principal at the time, he did not think anyone would want to sign up for the class. Peele remembers having a waiting list of 50 girls. She would pick the girls by drawing names from a hat. In the following years, there was a second class added to accommodate the large number of girls wanting to participate. Monday, Wednesday, and Friday were workout days with a focus on the Marine Fitness Test. Tuesday and Thursday were fun days. Peele worked intensely on finding an activity that was new and not normal for the girls to do on those days. Clemmer remembers the “Charger lap.” This was the lap up the large hill next to Ankeney Junior High School. The hill is no longer there because of Interstate 675. Clemmer found her love for running and sports in Chargers and continued playing volleyball at Wright State University. “Because of Ms.Peele, I started playing sports at Ankeney (volleyball, basketball, etc.) which I continued into my years at Beavercreek High School where I joined the Marine Fitness Team, played volleyball, basketball, and ran on the track team,” said Clemmer. The girls participated in several other outdoor activities like football, ice kickball, running, softball and much more. When it snowed, the girls would divide into different squads and build snowmen. The losing team would be dumped in the snow according to Peele. Her class would be outside during the snow, mud, rain or shine. The girls would wear shower caps to protect their hair and bring special clothes just for Chargers. Bringing home, a garbage bag full of muddy clothes was normal. Peele remembered a parent telling her how her class was the cause of a stopped-up drain. Peele wanted her class to be fun and memorable. In her class, everyone was friends despite the different social cliques. After five years, the class was no longer available due to liability issues. But, Peele could not remember any incidents ever occurring. 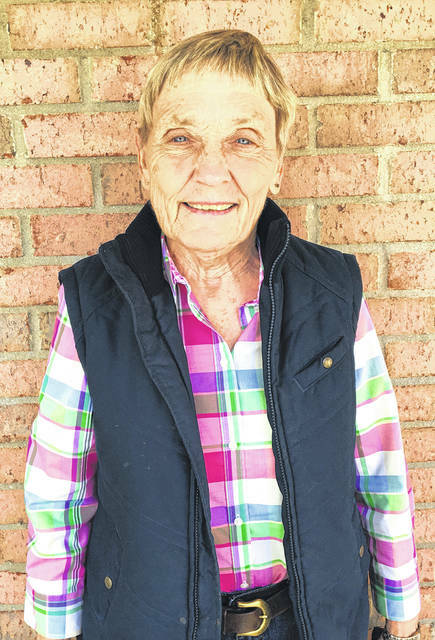 “Never once, as a junior high school kid, did I ever tell Ms. Peele what a difference she made and I moved on with my life having never said Thank You,” said Clemmer. After Peele read the letter, she was surprised someone took the time to write the letter and thank her. Peele enjoyed her time at Beavercreek City Schools. She started in 1969 as the first physical education teacher at the new, Ankeney Junior High School. She had the opportunity to make her own guidelines. Peele taught at Warner in Xenia during 1967-1968. If there was not such a great opportunity at Beavercreek she would not have left Xenia explained Peele. Her last 27 years were spent as a part-time physical education teacher and assistant athletic director. Being assistant athletic director was time consuming. She had to be at the school at 7 a.m. and would be lucky if she arrived at home around 9 p.m. according to Peele. She retired in 2000. Peele played softball as a student at Xenia High School and Bowling Green State University. After college, Peele continued to play softball and currently plays senior softball on the Ohio Cardinals. She has won five World Series Titles, traveled to many states and pitched several winning games. Additionally, Peele and her dog, Rooshe, visit Hospice and several local nursing homes. Rooshe, her 8-year-old yellow lab, loves people. “He is so loving and I have to share him,” Peele said. Peele is a Xenia native who promised she would make something out of herself despite growing up in a poor family. Peele has made something of herself not just in softball but by impacting many students at Beavercreek City Schools, just like Clemmer. “Tell her I am very proud of her and glad that playing in the mud helped her personality,” said Peele. Clemmer is the business office manager at a retirement community in Pennsylvania. She is starting her fifth year helping manage 150 residents. She holds a master degree in human resource development. After speaking to Clemmer about Peele’s response, there were lots of laughs and appreciation. “You made my whole day,” said Clemmer. Teachers spend five days a week with children and help set them on the right track. That is just what Peele did. “This is a moment that changed my life and set me on a path that has made me the successful, happy person I am today,” said Clemmer.